Twitter 360 is an iPhone application that is designed to allow you to visualize your nearby Twitter friends. It uses the new Twitter Geotagging feature to geotag your tweets. "Latest Tweets" mode. See the latest tweets of your friends (iPhone horizontal position), and the location from where they were posted (iPhone vertical position) using the Augmented Reality functionality. When a tweet is selected, a blue arrow (compass) is displayed to show the direction and the distance to the location from where the tweet was posted. 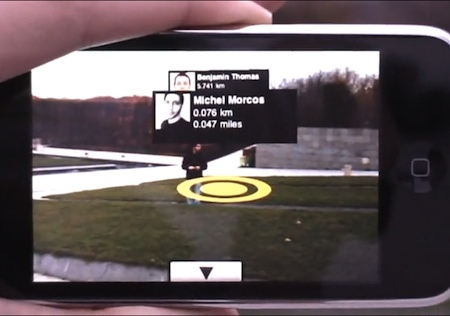 The distance is updated in real time as you walk in the streets. "Locate my Friends" mode. List of all your best friends. Twitter 360 lets you track geographic movements of your friends, you can now see where are located your nearby friends via Augmented Reality. If you want to hang out with a particular friend, use this tool to go meet him / her. Unlike the "Latest Tweets" mode (which is more focused on the tweets), the location of each of your friends is calculated with the "location" field data on the Twitter account. When a friend is selected, a blue arrow is displayed to show the direction and the distance to the location of that friend. The selected friend is highlighted in blue. The distance is updated in real time as you walk in the streets. Take a look at this short video demonstrating the use of Twitter 360. Daniel Suarez' new novel Freedom makes substantial use of the augmented reality concept. Many people have special sunglasses that all them to impose a "gamer" view on the real world, in which each person has a tag showing their username, status and social responsibility score. From Twitter 360 via Frolix_8.